Marigolds are outdoor flowers capable of surviving during the cold winter months as long as you properly prepare the ground for the cold season. A properly prepared garden has plenty of mulch to ensure the marigolds retain their moisture throughout the winter, which leads to flowering during the summer. Once watered, the mulch seals in the area's moisture and the flowers require little fertilizer in order to return during the flowering season. 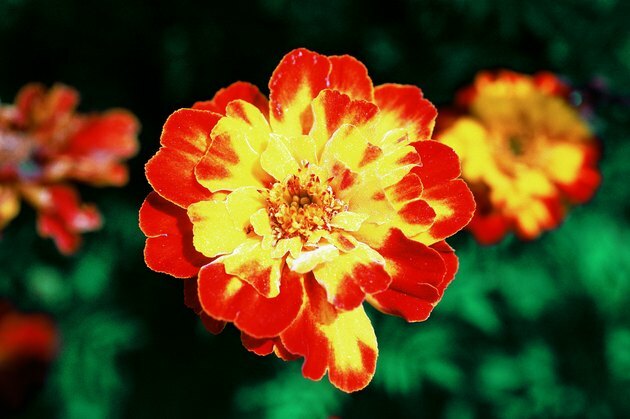 Marigolds can survive in some winter environments when properly maintained. Place the marigolds in an outside area that receives at least six hours of sunlight daily. The flowers require lots of sunlight to maintain its vibrant color, and can quickly die if proper light is not provided. Cover the soil around the marigolds with 2 to 3 inches of mulch such as shredded bark. Keep the mulch at least 5 inches away from the stem of the marigolds to prevent rotting. Water the soil around the marigolds until the soil located 2 inches below the surface is moist. Watering the marigolds deeply is necessary to ensure to roots receive the moisture, as light watering only affects the surface and quickly dries out during the winter. Maintain moisture by watering twice a week. Snap off the dead or wilting flowers near the base of the flower to promote regrowth. A Chicago-based writer, Mario Calhoun has been writing professionally since 2007, with work appearing in local publications such as "Mint Magazine" and "Echo Magazine," Columbia College Chicago's student magazine. Calhoun currently works at Murder Mystery Maniacs, an event planning company. Calhoun graduated from Columbia College Chicago in May 2008 with a Bachelor of Arts in magazine journalism.